3 0 • O U T PA T I E N T S U R G E R Y M A G A Z I N E • O C T O B E R 2 0 1 8 My Turn Angela Ross, RN, BSN, CEN O oooh! I can't believe it's over. Am I done? Why can't I feel my leg? Where is my husband? It hurts! Somebody, please! My fifth patient of the day just rolled into PACU Bay 6. I glance at the clock and realize it's only 10 a.m. Another busy Monday. I lean forward to introduce myself as her nurse and she's crying ... already she's crying. Thinking to myself about how heavy this patient will be and how high her needs are within the first 20 seconds of exposure. How in the world am I going to get through this? Her name was Susan. 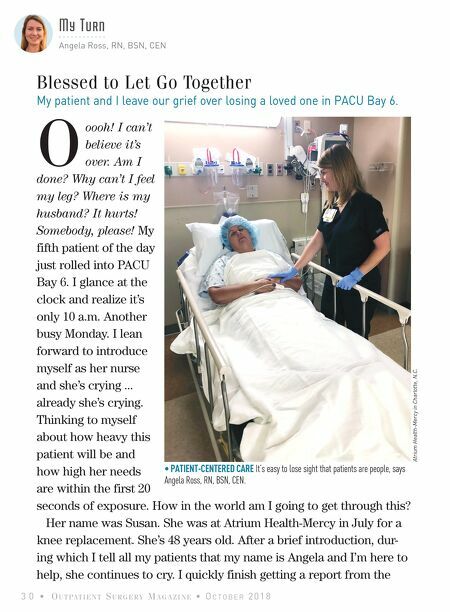 She was at Atrium Health-Mercy in July for a knee replacement. She's 48 years old. After a brief introduction, dur- ing which I tell all my patients that my name is Angela and I'm here to help, she continues to cry. I quickly finish getting a report from the Blessed to Let Go Together My patient and I leave our grief over losing a loved one in PACU Bay 6. 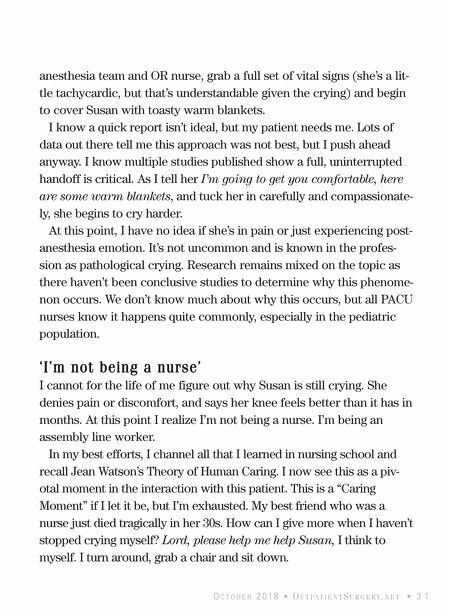 • PATIENT-CENTERED CARE It's easy to lose sight that patients are people, says Angela Ross, RN, BSN, CEN. Atrium Health-Mercy in Charlotte, N.C.